Are you a man who loves the water, but always jumps in and THEN remembers to remove your watch? Or, are you a man who simply loves the idea of owning a nice watch, but would rather skip the super fancy and sometimes too shiny silver bracelet? 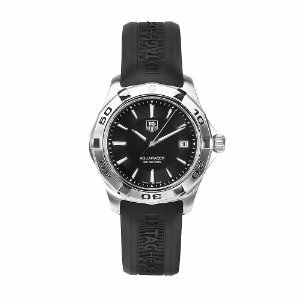 Well look no further than the Tag Heuer Aquaracer Men’s Black Dial Watch WAP1110.FT029. This timepiece has a bracelet made of alternative material built for water sports, and still has enough class to make you look like a man with an eye for a cool, modern watch. Most guys want something that may even provide a bit of comfort too. All your buddies will be dying to know where they can get their hands on one – it’s the newest trophy for the jock/athlete in you! Unique to this watch is its black rubber strap. However, the bezel is still made of the usual stainless steel with numeral markings at 10, 25, 40, and 50 minutes. The dial is black with longer defined hash marks at each hour, and tiny ones for each minute. It has two silver-toned hands for hours and minutes of course, but there is a second hand for even more precise time-telling. Next to 3 o’clock is the bonus feature of a date display. Amazon.com, Newegg.com, and Buy.com all sell the Tag Heuer Aquaracer WAP1110.FT029 at a price of $1,095.00. The latter two however charge no tax or shipping fee, while Amazon does up the ante with a $104.03 tax. If you like the idea of a rubber watch but the black dial and wristband is a bit of overkill for you; take a look at the Tag Heuer Aquaracer Men’s Silver Dial Watch WAP1111.FT6029. Similar watch with a similar price – now everyone’s happy!